Klamath Falls, Ore. - On Wednesday, April 4, 2018, Sugarman’s Corner in Downtown Klamath Falls became home to the Day of Hope community event. An event dedicated to child abuse prevention in Klamath County and to proclaim April to be Child Abuse Prevention Month in Klamath County. “Today our purpose is to prevent and eventually eradicate child abuse in our community,” said Billy Redd Pastor of Refuge City Church and Emcee of the event. Nearly 200 attended the event with several dignitaries observed in attendance as guests. Observed in the crowd were: David Henslee, Chief of Police; Chris Kaber, Klamath County Sherriff; Airmen from the 173rd Fighter Wing, among others. Music was performed by the Henley High Touch of Class Choir Directed by Chris Benjamin and students from kindergarten class at Stearns Elementary. Students from Klamath Union High School also sang as part of the Day of Hope event. “These kids are so worth it,” Meyer said. Redd took a moment to explain the purpose of the blue pinwheels. 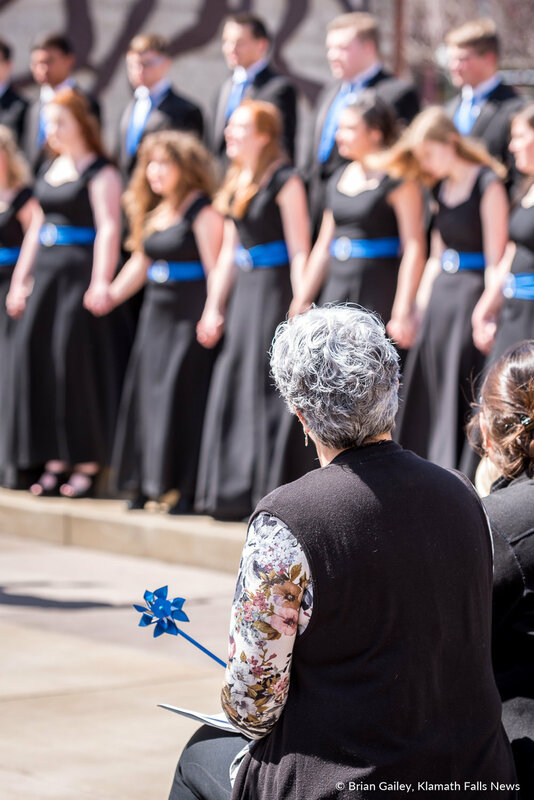 If you take a closer look at the pinwheel you will see this is like a perfect representation of why we are here today celebrating this Day of Hope and what we are doing here today. From a distance your pinwheel is going to look like it is just one big unified apparatus. But when you look closer you will see that there are all these individual spokes all these individual little parts. And each one of those is united by the axel in the middle. There is a pin that goes through these, there is a common purpose to this pinwheel. To see progress, to get this thing spinning, it takes all of the agencies, businesses, schools, government organizations, faith community, law enforcement and us as individuals in our community. We’ve all got to work together and align ourselves in the right direction in order to get these things spinning. In order for progress to happen when it comes to child abuse prevention. In Klamath County we have many agencies and organizations working to prevent child abuse and they are doing a great job at it and we are so thankful for all of the efforts that have been put in over the years about child abuse prevention. I have had conversations with some of the key players and there is this real since of momentum, forward momentum when it comes to child abuse prevention. Organizations and community members are in agreement and they are aligning themselves like never before in history in our community. Here is an amazing thing about the pinwheel, it is all powered by an unseen force. My pinwheel is sometimes turning and sometimes not. There is an unseen force that is making it happen. It’s nothing I am doing, wind. You can’t see the wind it is an unseen force. In our efforts toward child abuse prevention is also powered by an unseen force and that is the spirit of hope. The spirit of hope is what propels us forward when it comes to child abuse prevention. 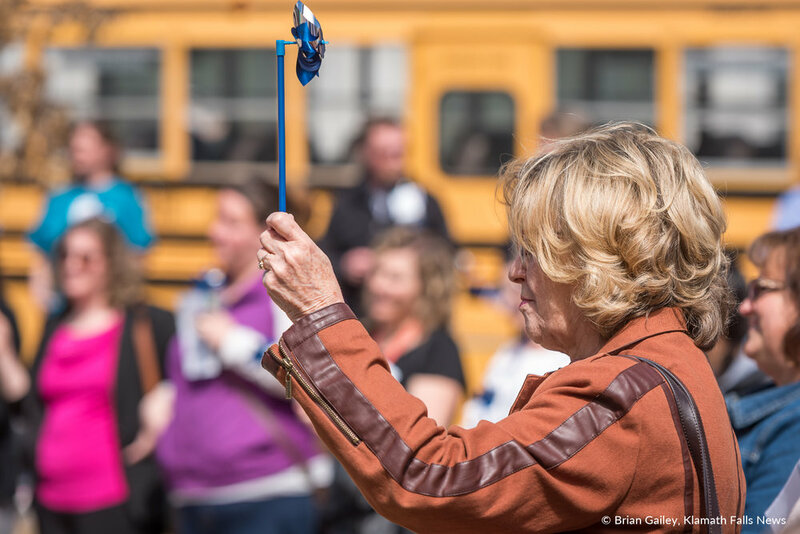 Due to the response of a Day of Hope and Child Abuse Prevention Awareness month, pinwheels are hard to come by in the State of Oregon. If you or your organization wishes to host a pinwheel garden in April 2019 contact Susan at Klamath Lake Community Action Services (http://www.klcas.org/ or 541-882-3500). In 2017, there were four pinwheel gardens around the community. That number has grown to eighteen for 2018. By 2019, they are hoping for fifty plus around the community of Klamath Falls.